Out in the Great Plains, prairies are dry, wind-swept grasslands. Images come to mind of bison herds and prairie dogs standing watch over an endless expanse of bluestem and switchgrass. The picture is very different in central Florida, where the word prairie refers instead to seasonal wetlands. In Ocala National Forest, the Trail hugs corridors of grasslands surrounded by pine forests. These grasslands flood in the wet summer months, becoming freshwater marshes and even lake-like if the rainfall is heavy enough. In winter the grasses turn brown and brittle, the ground beneath them so thoroughly dried-out that one can walk across it. During that time they resemble the prairies of the Midwest. The Ocala ecosystem is adapted to this extreme seasonal variation and unique plant species live in the prairies. Generally it refers to a stand of trees that form an ecological island different from the surrounding landscape. In Nimblewill Nomad's memoir Ten Million Steps, he expresses confusion over the term "tree islands" on his maps. Confusing it is, since the term is unfamiliar outside the American southeast, mostly used in Florida, and used four different ways. 1) Within the salt marshes that line Florida's Gulf Coast, small mounds of soil build just high enough to allow palm trees to take root. These clusters of densely packed palms are technically islands since they are surrounded by water, but often only at high tide when the salt marsh floods. The impenetrable marsh grasses mean many or most coastal tree islands have never been visited. 2) In central Florida grasslands and prairies, tree islands are small clusters of hardwoods (usually oaks) that provide much-needed shelter from the sun in these hot, wide-open spaces. For example, in Myakka River State Park (not on the Trail), backcountry campsites are tucked into places with names like Bee Island. 3) Dry sandy hills run through the center of the peninsula like a spine, the remnants of ancient sand dunes. So dry is this hill country that it is almost desert-like, and is called the scrub. Little can grow tall in the scrub, but there are a few places where the soil retains more moisture - just enough to support pine trees. These stands of pines rise above the surrounding scrub like islands on the sea, and are where frontier settlers lived. The characters in The Yearling homesteaded in such an island, and FT hikers can take a side-trail while in the Juniper Wilderness to visit Pat's Island, the real-life inspiration for The Yearling. 4) In the Everglades, tree islands are true islands, teardrop shaped lands carved by the flow of water through the freshwater marsh. On these islands grow oaks, maples, mahogany, gumbo-limbo, and other trees. Scientists use the term "hammock" (see below) instead of tree island, but locals and non-scientists use the two terms interchangeably. In our experience as Florida natives, "tree island" describes small hammocks whose edges and boundaries are visible and obvious when standing just outside of it. Hammocks are much larger and their edges/boundaries can only be seen at a distance or from above. (n) Ecologically identical to "tree island," ecologists and other scientists use hammock to describe stands of trees (usually hardwoods) that form an ecological island that contrasts with the surrounding landscape. Sometimes spelled as "hummock" or even "hommock" though "hammock" is the dominant form. The origin of the term is not known, but appears first sometime in the sixteenth century, most often in reference to Florida. William Bartram uses hammock throughout his Travels. (n) The noun can refer to any marks made on trees to identify the location of a trail. In the nineteenth century, the US Calvary carved shapes and letters into tree trunks in the Sierra Mountains. Metal plates stamped with the AT logo were nailed to tree trunks in the early days of the Appalachian Trail. Today, blaze primarily refers to painted rectangles the size of a dollar bill, roughly 2x4 inches tall. The Florida Trail route is marked with orange blazes, rather than white as on the AT. The close association between Florida and oranges probably motivated that decision. Short side trails to campsites, shelters, and water sources created by the Florida Trail Association are blazed blue, as on the AT. However the FT intersects many other trails which may be blazed red, white, green, yellow, or blue. A few side trails in Kissimmee are identified by metal tags with letters stamped on them. (v) From “blaze” comes a whole vocabulary to describe different actions while hiking: white blazing, blue blazing, yellow blazing, green blazing, and pink blazing. These terms are primarily used on the AT, where trail culture is most developed and they do not translate to other trails very well. Since the FT is blazed orange and does not have many sightseeing blue-blazed side trails, these expressions are a bad fit. The FT is little hiked and trail culture is undeveloped, but we have never heard anyone say “orange-blazing” and don’t expect to in the future. Besides, the FT intersects trails blazed green, yellow, red, et cetera so the use of the AT terms would probably create confusion. (n) Refers to a package of gear, clothes, other items that a hiker does not need currently and so does not want to carry, but may want in the future. Rather than mail the stuff home, they address the box to themselves and send it to a location farther up the Trail. Usually this is Priority Mail box sent from post office to post office. As long as you do not open the package, Priority Mail boxes can be forwarded for free, and thus “bounce” down the trail from town to town with you. (v) To hike off-trail and push into the undergrowth. In order to make progress you have to whack bushes and branches out of the way. Then they whack you back. Because sub-tropical plants grow so quickly and trail maintenance is so irregular, it can feel like you are bushwhacking while nevertheless remaining on the FT. There are just a few shelters on the FT, but many more established campsites with picnic tables or benches. Nevertheless, much of the time you will be stealthing — making camp wherever you find a dry and flat spot. Persistent rain and an abundance of insects (particularly mosquitoes and ticks) make cowboy camping unpleasant in subtropical Florida. The best place to cowboy on the FT is along the Gulf Islands National Seashore — the last few days of the hike. A thru-hike completed without going in a single direction the entire time, usually motivated by weather concerns. We aren't sure if anyone has ever flip-flopped on the Florida Trail, since the thru-hiking window of opportunity is wider relative to the AT and PCT, and the fact that flip-flopping does not provide a climatological benefit. On the Appalachian Trail, for example, Mount Katahdin is often closed by October 15th due to extreme weather/snow. If a northbound hiker arrives in say, Harpers Ferry WV and decides he or she will not make it to Katahdin by then, they may drive up to Maine and hike south back to Harper's Ferry. In that way they hike the entire trail in one season, just not in a single direction. By hiking south as the season moves into fall, they hike away from colder temperatures toward warmer ones. On the Pacific Crest Trail, if one arrives at the Sierras too early in the season, too much snow can make the Sierras impassable. Hikers can choose to drive/hitch north and then hike south. By the time they reach the Sierras the snow has hopefully melted enough to the make the Trail passable. On a northbound Florida Trail hike, skipping ahead to the northern terminus and then hiking south provides no benefit, and even makes the trip worse, since it means hiking down into hotter, summer-like temperatures while north Florida is still in spring. (n) A large cluster of people hiking within a few days of each other. Between bubbles hikers are few and far between. Bubbles form as people make friends and synchronize their paces. Bubbles can also form if prolonged bad weather discourages hikers from leaving a town or a camp. As each day of bad weather passes, more and more people arrive in town and remain there. Hikers once separated by days are now in the same place, while no one is on the trail ahead of them. Once the weather clears, everyone leaves town on the same day, creating a massive bubble. Since there are so few thru-hikers on the FT, there are few bubbles. In 2015 the Florida Trail held its first "kickoff" party at the southern terminus, leading many hikers to start their hike within the same 3-day window. Essentially all the hikers for that year were in a single bubble, at least initially. (adj) Refers to any business, or even a whole town, that actively works to make hikers feel welcome and invited. Motels that will hold a package for you, restaurants that set aside a place to store your backpack, and outfitters with couches where hikers can chill out and charge their phones, are all examples of what can make something hiker friendly. In this sense, there are very few places on the Florida Trail that are hiker friendly. There just haven't been enough hikers year after year to influence business behavior. We wouldn't call any place hiker "unfriendly," however, since that would imply that a business was actively discriminating against hikers, which is illegal. "Hiker indifferent" is more accurate. (n) The limping wobble that hikers develop on zero-days from swollen knees, swollen feet, or blisters. Seems to go away when we're actually hiking. (n) About 8:30pm. Thru-hikers become accustomed to getting into bed soon after nightfall. Staying up late while in town is tough. A expression used by hikers to emphasize the personal, unique, and idiosyncratic nature of a thru-hike. Often used as a rebuttal to "purists" or any other attempt to (see below). Can be used defensively as in, "Don't tell me what to do. Hike your own hike." Can be used to soften advice as in, "That's how I do it, but it may not work for you. Hike your own hike." (n) A thru-hiker dedicated to hiking every foot of the primary trail and who will not take blue-blazed side trails or loop trails, let alone skip a section by hitchhiking. Most self-described purists are found on the AT. The Florida Trail blows the concept of being a "purist" out of the water. The official FT route includes giant loops around Okeechobee and Orlando, and thru-hikers must choose one side or the other. In other words, the FT is not a single footpath that someone can rigidly adhere to. (n) Dirty, bearded men traveling alone can have a hard time getting a hitch. Women and couples traveling together get rides faster. A woman can help a man get a hitch simply by standing next to him while he has his thumb out. When that happens, she is his ride bride. This relationship can be thought of as one-way. After all, women don’t need men to get a ride, but women may feel safer hitching with another (male) hiker than when alone. (v) Hiking without your full pack during a thru-hike. This is only done with assistance. The hiker takes a mostly empty backpack with lunch and maybe rain gear or an extra jacket, while someone else takes the rest of their stuff to a pre-determined point farther up the Trail. On the AT this is often done with the help of trail angels and hostels. Since the FT does not have an established network of trail angels and hostels, there are no opportunities to slackpack unless you will have a support team in a vehicle — which is not most hikers. (n) Unsolicited, and often unexpected, gifts and assistance to hikers. Usually comes from strangers, but if your friends surprise you at a road crossing and take you to dinner, that's trail magic too. On the AT and PCT, trail magic often appears in the form of a cooler filled with sodas, candy bars, fruit, et cetera stashed along the trail somewhere. There may be people cooking burgers at a road crossing and handing them out to any hiker that comes along. This kind of trail magic does not happen on the Florida Trail since, as is always the case, there just aren't that many hikers. On road walks however, we have had strangers, who just happened to be driving by, pull over and offer us apples, Gatorade, M&Ms, all sorts of stuff. (n) Someone who dispenses trail magic. On the AT and PCT there are "professional" trail angels who host hikers in their home every year, off rides to the grocery, et cetera. They may even have business cards that say "trail angel" and pin them to trees near road crossings. This is far less common on the Florida Trail. However, Friend and Keatley's guidebook lists the phone numbers of trail angels, and the FTA provides a list of trail angels (FTA volunteers) in their thru-hiking packet. (n) The use of "karma" here does not refer to the Hindu or Buddhists beliefs about "the sum of a person's actions in this and previous states of existence deciding their fate in future existences." Instead it is more like the vaguer, westernized version of the idea about cosmic cause-and-effect — that your actions will bring about inevitable results, good or bad, not directly but through vague, undefined cosmic forces. No one hiking the Trail likely believes in cosmic forces, however. The expression is often used as an admonishment for non-ethical behavior. If someone leaves trash in a firepit, another hiker might say, "Bad trail karma, man." It is also used when referring to ethical behavior. If someone finds trash in a fire pit and decides to pack it out themselves, they might say, "Good trail karma, you know?" 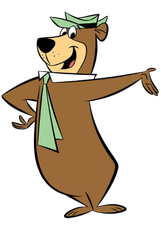 (v) Besides wearing a tie, Yogi the Bear’s defining characteristic was that he concocted conniving schemes to steal picnic baskets from park visitors. While thru-hiking, you are—like Yogi the Bear—a creature living in the woods, different from day-hikers and weekend visitors. When you approach and chat up anyone besides your fellow thru-hikers in order to get a ride, meal, et cetera you are yogi-ing. It can be used in both a positive and negative way. Some people are just naturally charming and comfortable talking to strangers and so they amaze their shyer hiking friends by how easily they get offered rides or free Cokes. Critics see yogi-ing as scheming and deceitful, a tactic of using someone’s politeness to get what you want from them. (n) A type of thru-hike wherein after completing their thru-hike in one direction, a hiker turns around and hikes the entire trail again, in the opposite direction. As far as we know, no one has ever yo-yoed the Florida Trail.